Formed in 1909 as Maungakiekie Golf Club, Titirangi Golf Club, as it is now known, is the only course in New Zealand that can say it has Alister MacKenzie as its golf course architect. It was whilst MacKenzie was in Auckland in 1927 during a short fishing holiday to the country that he created drawings and designed a routing for the course which is still in use nearly 100 years later. Towards the mid 1990s, the club realised the course was in need of an overhaul and Chris Pitman was contacted to redesign and remodel a number of holes. Millions of dollars later, much has been achieved – including tree removal, upgrading of the 15th hole and reconstruction of the 6th green. The renovation programme is now complete, confirming Titirangi’s reputation as one of Auckland’s best golf courses. Two of the four long par threes at Titirangi are exceptional holes. The tee box on the 187-yard 7th is located amongst tall pine trees but the tiered, sloping green is relatively exposed, making correct club selection critically important. The 203-yard 14th is all carry across native bush and a creek to a fast, undulating green protected by a bunker to the front right. A glow of satisfaction will be well earned if you mark a pair of threes on your scorecard for these two holes. Chris Pitman – course architect commented as follows: “From an 18-hole master plan all the holes except three have been restored. Mainly greens, tees and fairway bunkering. MacKenzie's original sketches, still in the Club's archives, were followed together with carefully calculated estimates of what, in his style, his further input would have been had he remained longer in New Zealand. This is certainly one of the best courses in Auckland, a bit of a slow start with hole one and two but there after some truly excellent holes with 14 being one of the best par threes in the country. The weakness with this course is in the par 5s of which there are only two and both rather short. Also the finish is a rather lame dogleg par 4. 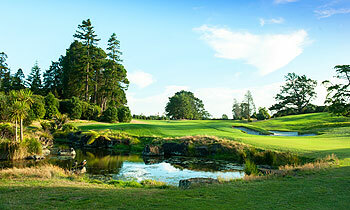 Its a great example of a NZ parklands course and not bad value for money. Titirangi Golf Club, is yet another grand Kiwi centenarian. Conceived in 1914 and bearing the unmistakable signature of the master craftsman of yesteryear, Alister MacKenzie. His design and routing endure to this day. Utilising those original 1927 drawings and plans, the club has recently completed an extensive refurbishment. The objective of this comprehensive restoration program was to take the course back to the master’s original design. Mission accomplished – in grand style, thus reasserting Titirangi’s status as one of New Zealand’s pre-eminent courses. A relatively short but strategically demanding layout which for decades, has sat comfortably in the upper echelon of New Zealand courses. Unfortunately, due to circumstances beyond our control, I didn’t get the opportunity to play the course but availed myself of the interesting and informative guided tour provided by the genial Director of Golf, Doug White. Titirangi plays to a par 70 of at just over 6000 metres from the men’s black tees. Not overly long, but strategically strong, it carries an NZG slope rating of 127 and a CR of 72.00. Five sets of tees are on offer to ensure that players of all proficiency are well catered for. The round commences with a pair of relatively mild par 4’s of just 282 and 290 metres, 18 and 10 respectively on the card. From there, strap yourself in as the strategic value of the master’s design now really comes to the fore. 3 is a strong par 4, followed by an outstanding par 3 of 169 metres. Then the first of the par 5’s, ‘Longfellow’, is a gradual right-hander – the intrinsic positioning of the fairway/greenside bunkering an absolute treat – calling for strategic and accurate play to and from the fairway. Get it wrong at your peril. I consider the green complex at 13, ‘The Wrecker’ as possibly the best illustration of MacKenzie’s genius in presenting a great conclusion to a hole. A large, undulating, multi level putting surface, protected by strategically positioned greenside pots, again indicative of the Master’s classic bunkering. Just a treat. As a general comment, the greens provide a tough but fair but assessment of your prowess with the flat stick. A great example of which is the tri-tiered 14th where a vast range of pin placements are at hand, and a bunt from above the hole, in almost every instance, will require at least two more. Again, at the 187 metre, par 3, 14th signature hole below, calls for a nerve-wracking shot across a sea of local flora to a no bail-out, multi tiered green, aptly named, ‘Ramparts’. A visually, most attractive parkland setting, as picturesque as any I have encountered in my travels. Fairways although somewhat ‘damp’ at the time, offered excellent cover and a bad lie through the green, unlikely. And, just to keep you honest, serious pre-shot consideration a prerequisite for play from the sometimes undulating fairways. The design variety of the holes is diverse and brilliantly laid out in this beautifully preserved natural bush setting. The reasonably lengthy par 3’s and several quite short par 4’s provide an interesting diversity to this layout. Indicative of such, the four par 3’s which play from each cardinal point of the compass. Write three on the card for each this clutch of holes and you have the makings of a good score. The conclusion to the round provides yet another graphic illustration of the art form that is the MacKenzie signature bunkering. A great golf course design in pretty good condition considering the very hot weather in NZ recently. The Course rewards strategic placement of drives (as do all A McK course) and there are the usual visual tricks that try to convince you that another route is better/easier. The welcome at the pro's shop was excellent and we had a thoroughly enjoyable round. Compared to Kauri Cliffs this is excellent value and a must play for the quality of design And variation of holes. It is also visually very attractive. Back to Titirangi six years after my first visit – it’s mostly as I remember it, with the very best use being made of some rolling suburban parkland / bush. Sometimes I wander round a course, and am left scratching my head about the positioning of a bunker, or a routing decision. None of that here – e.g. it really feels like all the traps are in the right places. And again, I got 12 of my 14 clubs dirty, suggesting some real diversity of required shotmaking. Just to quickly update on some slight changes in the last few years. Several approaches have been sandcarpeted over the final 20-30m before the green (#’s 6, 8, 12, 13, 17 and 18), partly to aid drainage, but also with the aim of introducing firmer and faster playing arenas, encouraging a running approach. More work is also planned (e.g the 3rd). Apparently, Alister MacKenzie visited Auckland in the summer, and unsurprisingly he had firm conditions in mind when he laid out the course. I am guessing that it has always been a challenge to maintain this type of surface, due to the clay base underneath, and I didn’t really get to appreciate the fruits of the club’s labour, as I played towards the end of a reasonably wet winter. In fact, I haven’t managed to play Titirangi in summer yet, so in many ways, I haven’t really tasted the full delights of the design yet, or really come to appreciate the strategy needed. The other changes are on the 13th and 16th tee shots. Previously, both were hair-raising drives through chutes carved through the trees. Now, after some substantial tree removal, it is more open, particularly on 16, where the whole fairway is now visible. It must have changed how I thought about the entire hole, because I never really appreciated the beauty of the 16th green and surrounds the last time around. A wide but shallow surface, wedged into the right angled corner created by boundary fence and road, protected by a deep trough and a wickedly contoured bunker front left, all insisting on some sharp distance control with a short to mid iron. Some visitors may be a little disconcerted by some of the extreme contours on the greens. We found two pin placements where it was literally impossible to lag your putt within 15 feet if you were above the hole – you had to hole it to get close, so to speak. I’ll not express too polar an opinion here, rather raise three questions: 1) isn’t it the pin placements that are severe, and not necessarily the greens? 2) as my playing partner so astutely pointed out, is golf necessarily meant to be fair? 3) it’s not exactly a secret that to play another extremely well-known MacKenzie course, you need to be below the hole or you’re in trouble. We see it on the TV every April, and it fascinates us, adding another layer to the excitement. Should you really feel let down if that same intricacy bites you on occasion? For me, it’s all in the game. Matt obviously knows a bit about golf courses. The weather also plays a big part when playing Titirangi...if the wind is blowing(and it usually does! )even the first hole will test your ability to score.You should also be aware that the four par 3s play to each point of the compass.I'd be confident in saying that you can't call yourself a golfer until you can play to your handicap at Titirangi. It really is "The Fringe of Heaven"
Titirangi is a nice city course and a great course design that will stand the test of time! The undulations, bunkering and gullys are the main hazards. Particurlarly the par threes are all great holes and give the course some chareter.